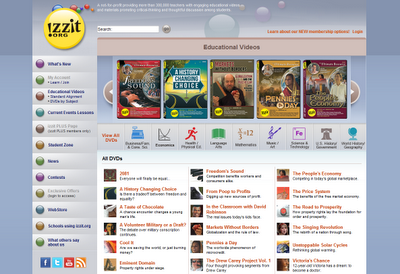 If you haven't already done so, make sure you check out the new features at izzit.org! We are very excited this year to have a completely revamped Educational Videos page which allows teachers to search for DVDs by Subject. We also now have Common Core Standards on our Standard Alignment page, a Student Zone, for students of izzitPLUS members to access Current Events, games, and more, and, of course, this News page. Check out our "What's New" section to see all the new features. And don't forget to order your Free Annual Video while you're there!